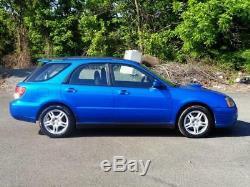 LOW MILES 3 KEYS 2 REMOTES CASSETTE/CD-PLAYER CRUISE CONTROL CLEAN RUNS GREAT. 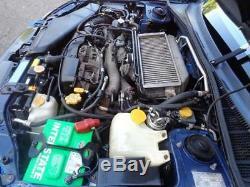 4 Cylinder Engine 2.0L. Actual mileage will vary with options, driving conditions and driving habits. RIGHT ARROW OR SCROLL DOWN TO VIEW OVER 50 PICS UPLOADED! 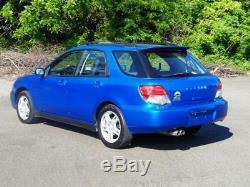 2004 Subaru Impreza Wagon WRX Sport TURBO WAGON AWD 4WD! FRONT AND REAR DISC BRAKES! Please make sure you have read and understood our description along with our. We will work with your bank or credit union to get you financing if needed and provide them with all the paperwork they required! Were located in NE Philadelphia, PA 19116. If you have any questions about this or any of our other auctions please feel free. 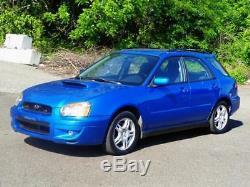 If you are thinking about purchasing this vehicle, were here to answer ALL of your questions. So do not wait till last minute! Thank you for your interest and we look forward to hearing from you! Aerodynamic black body-side ground effects molding. 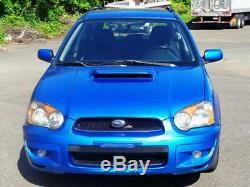 Automatic-off multi-reflector 4-beam halogen headlights w/smoke tinted lenses. Fixed intermittent rear wiper w/washer & de-icer. Projector beam halogen fog lights. (4) cargo area tie-down hooks. 60/40 split fold rear bench. Cargo area grocery bag hook. Cup holders-inc: retractable front/center console. Dark gray metallic trim-inc: center bi-level vents. Dome light w/off delay feature. Driver & front passenger covered visor vanity mirrors. Instrument panel w/tachometer, engine coolant temp, low-fuel light, dual mode digital trip odometer. Performance-styled reclining front bucket seats w/driver-side height adjustment, integrated fixed head restraints. Pwr windows w/driver-side one-touch down feature. Silver metallic trim-inc: audio bezel, audio face plate, side bi-level vents. 15.9 gallon fuel tank. 16" x 6.5" alloy wheels. 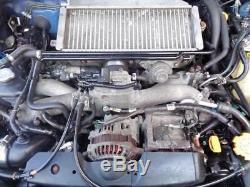 2.0L DOHC SMPI 16-valve intercooled turbo 4-cyl boxer engine. Pwr vented front/solid rear disc brakes. Speed-sensitive variable assist pwr rack & pinion steering. Viscous type limited-slip rear differential. 3-point height adjustable front seatbelts w/pretensioners & force limiters. 3-point rear seatbelts w/height adjustable outboard anchors. Child safety rear door locks. Driver & front passenger depowered airbags (SRS). Driver & front passenger head/chest side impact airbags (SRS). Rear child safety seat anchors. No allowance or set aside will be made on account of any incorrectness, imperfection, defect or damage. 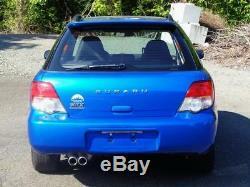 We've taken the responsibility to provide you with all information we have available regarding this vehicle. However, not all information regarding this vehicle has been obtained and therefore it is advisable to have and independent mechanic review this vehicle and obtain a vehicle history from CarFax. IN NO EVENT SHALL WE BE LIABLE FOR ANY SPECIAL, INDIRECT, PUNITIVE OR CONSEQUENTIAL DAMAGES RESULTING FROM ANY USE OR PERFORMANCE OF OR CONTENT ERRORS OR OMISSIONS OF INFORMATION. The purchaser will bear entire expense of repairing or correcting any defects that may presently exist or that may occur in the vehicle. We neither assume nor authorize any other person to assume for it any liability in connection with the sale of this vehicle. All test-drives and inspections are welcome! All vehicles have to be picked up by the winners or a qualified shipper by their choise. We assume no responsibility for damages incurred after the vehicle leaves our lot. We are not affiliated with any carrier. Please, expect POSSIBLE little scratches, bug or rock marks, tiny dents or dings, paint and interior wear when purchasing used vehicle. During normal usage of the vehicle on either the highway or city, this wear is unavoidable. Please understand that you are purchasing a previously owned vehicle, which will have wear, so again, please refer to the pictures posted and if possible, make an appointment to inspect the vehicle yourself. We reserve the right to end any listing at any time if the vehicle is no longer available for sale. By backing out of the deal you willingly forfeit the deposit. Secure bank to bank wire transfer. All the buyers are required to have their valid driver's licence. 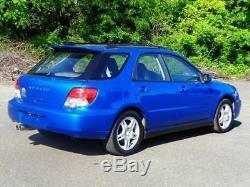 The item "2004 Subaru Impreza WRX Sport TURBO WAGON AWD 4WD 5-SPEED! 103K Mls" is in sale since Tuesday, December 4, 2018. 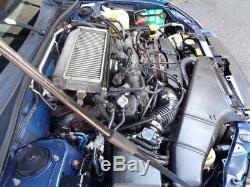 This item is in the category "eBay Motors\Cars & Trucks\Subaru\Impreza". 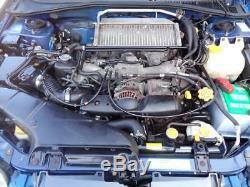 The seller is "idealsalez" and is located in Philadelphia, Pennsylvania. This item can be shipped worldwide. 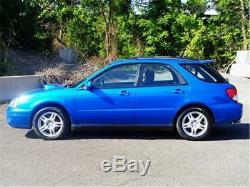 Trim: WRX Sport TURBO WAGON AWD 4WD 5-SPEED! 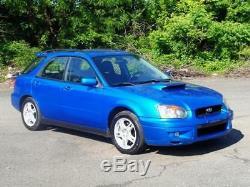 Sub Model: WRX Sport TURBO WAGON AWD 4WD 5-SPEED!